The plot takes place after the second wizarding world and after the rebuilt of Hogwarts .These days two new powerful wizards named Anton Devon and Robert Seah decided to continue teaching young wizards the art of magic . Hogwarts is now safer than even but for how long ? 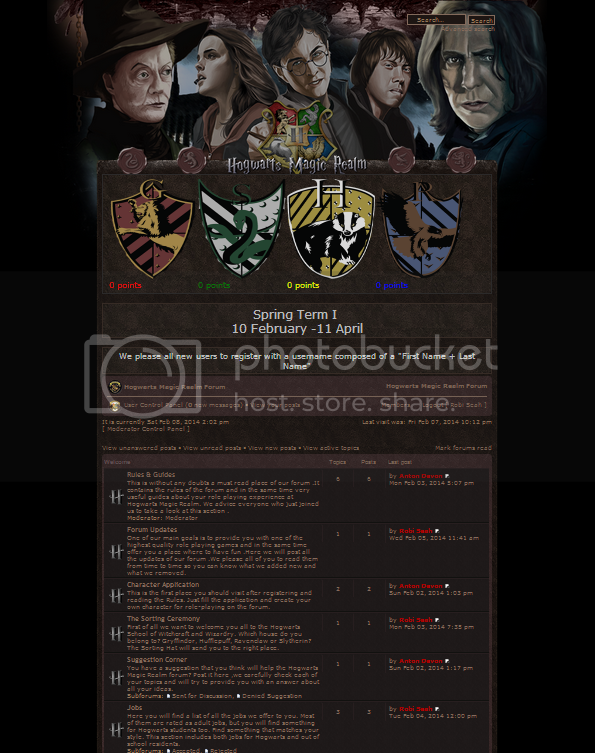 Hogwarts Magic Realm is a forum dedicated to every Harry Potter fan who enjoys role playing by post . Our main language is English and we accept all kind of users from all over the world as long as they can express themsleves in english . By doing your job you can win galleons (currecny used on our forum) which you can use to buy different wants and stuffs to make your character more powerful. Other notes:We hope you enjoy the look of our forum and for any kind of suggestions we please you to send a PM.